1. In a 30-60-90 triangle, the length of the hypotenuse is 6. What is the length of the shortest side? 2. What is the area of a circle with a diameter of 16? 3. The figure below contains only horizontal and vertical lines. Calculate its perimeter. 4. Find the measure of the missing angle in the triangle below. 5. The circumference of a circle is 30 . What is its area? 6. What is the sum of the measures of the interior angles of a hexagon? 7. Find the area of the triangle below. 8. The figure below is a parallelogram with two angles given in terms of x. Determine the value of x. 9. Which of the following could be the side lengths of a right triangle? 10. The figure below is an equilateral triangle with sides of length 6. What is the area of the triangle? 1. B. In a 30-60-90 triangle, the ratio of the lengths of the sides is 1: :2. In other words, the length of the longer leg is times the length of the shorter leg, and the hypotenuse is twice the length of the shorter leg. Therefore, the smallest side is half the length of the hypotenuse, so its length is . Now substitute this value into the area formula and calculate the area. 3. D. The perimeter of a figure is the length around it. To find the perimeter of a polygon, add the lengths of its sides. Start by filling in the missing lengths of the sides. For instance, the length of the shorter missing side is 6 because if you add it to the 3 on the left, the result should be the 9 on the right. Finally, add the side lengths together to find the perimeter. 4. D. The sum of the angles of a triangle is 180°. Therefore, if we subtract the two given angles from 180°, the result will be the missing angle. Therefore, the missing angle is 50°. 5. B. The circumference of a circle is given by the formula C = 2 , where r is the radius of the circle. Substitute the given circumference into this formula and solve for r.
Therefore, the radius of the circle is 15. Use this to find the area of the circle. The area of a circle is given by the formula A= 2. Substitute the length of the radius into this formula and calculate the area. 6. B. The sum of the measures of the interior angles of a polygon with n sides is 180 . (n – 2) A hexagon has six sides. Therefore, substitute 6 for n into the formula and calculate. Therefore, the sum of the measures is 720°. 7. A. The area of a triangle is given by the formula , where b is the length of the base and h is the triangle’s height. In the figure, the base is 8 and the height is 5. Substitute these values into the formula and calculate the area. 8. D. In a parallelogram, adjacent angles are complimentary; that is, they add to 180°. Use this to set up an equation, and then solve it for x. 9. E. If a triangle is a right triangle, then the lengths of its sides satisfy the Pythagorean Theorem, a2 + b2 = c2 . To determine which choice is correct, test each set of values by substituting them into the Pythagorean Theorem. Start with the first set of numbers: 3, 13, and 14. Since the result is not a true equality, the first set of values does not represent the side lengths of a right triangle. Test the other four choices. The only values that satisfy the Pythagorean Theorem are 5, 12, and 13. 10. 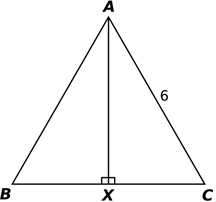 D. Since the triangle is an equilateral triangle, its angles are 60°. 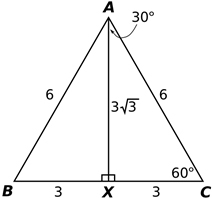 In addition, the vertical line AX bisects the angle BAC, so it splits it into two congruent angles of 30° each. Therefore, the two smaller triangles are 30-60-90 triangles. Thus, the ratio of the lengths of the sides is 1: :2. Use this to fill in the information of the figure as follows. The area of a triangle is given by the formula , where b is the length of the base and h is the height. In the figure, the base is 3 + 3 = 6 and the height is 3 . Substitute these values into the formula and calculate the area.